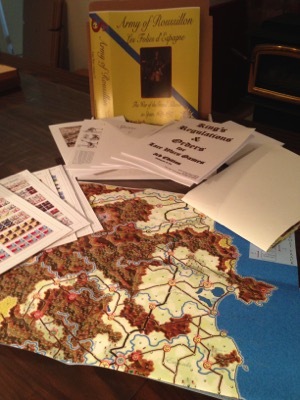 Volume XI in the Lace Wars Series; an Expansion Kit for Remember Limerick! 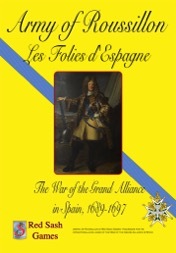 Army of Roussillon (AOR) is the eleventh volume in the Lace Wars™ series and the first in a set of four dealing with the War of the Grand Alliance (1688-1697). This war, sometimes called the War of the League of Augsburg or the Nine Years War, was the second of the three great wars of Louis XIV. As a young man he waged the Dutch War to expand France's borders. This was a war of aggression. As an old man he fought the War of the Spanish Succession to put his grandson on the throne of Spain. Despite the King's ultimate aim this was a defensive war. The War of the Grand Alliance was Louis' war of middle age - a war of grinding attrition involving nearly a million men. Spain, then ruled by the Bourbon kings' great rival, the House of Habsburg, joined the Grand Alliance, but she soon wished she had not. The Army of the Sun King was the premiere military machine of its age, the Spanish Army a fallen titan. Nevertheless, the Spanish saw the war through to its end. While her exhausted allies struck secret peace deals, Spain fought on. Only with the taking of Barcelona in 1697 did she sue for peace - and the decision to capitulate came from Madrid, not its garrison. Barcelona held for 63 days against a massive bombardment and multiple assaults that left 15,000 French dead on her glacis and in her shattered bastions. By the end, both sides were wondering if they would have the strength to fight another round. Catalonia was a secondary front. For much of the war the French fielded fewer men than the Spanish and were kept on a tight leash. The man in charge, Anne Jules de Noailles, II Duc de Noailles, was governor of Roussillon, formerly part of Catalonia. His Intendant, or 'commissar', was a Catalan. They hoped to harness one of the periodic peasant revolts that plagued the region and 'win hearts and minds' for France - or at least keep the Army of Spain dancing to their tune. Unfortunately, Noailles could not get his subordinates to buy into this program; the arrogance inherent in traditional military culture alienated the population and the French found themselves involved in a nasty guerrilla war. Only after Spain's allies began to withdraw from the struggle were the French able to bring overwhelming force to bear against her. In AOR, you will have a chance to change history - and even if you cannot, perhaps you can win enough glory to write your name in the history books. As the French, will you pursue a hearts and minds strategy, or try for all out conquest? Will you occupy territory or make surgical strikes aided by your fleet? (Be warned, the family that runs the Ministry of Marine is at odds with the family that runs the Ministry of War.) The French Army is state-of-the-art. You have more artillery, the latest equipment (bayonets instead of pikes), and acess to an administrative machine capable of supporting nearly 500,000 men. But you command a secondary front. Versailles will forever be taking regiments away from you, forcing you to rely on local militia and even Catalan renegades. If you garrison every post, you will be too weak to go on the offensive. If you give up captured fortesses to concentrate, the local population will believe you are weak and rise against you. If you do nothing, you will lose the respect of the Sun King and the Court ladies. As the Spanish, can you keep the French at bay? Or can you damage them enough to try a counter-invasion of Roussillon? Will the English send their fleet and land troops to aid you? Or, will the Holy Roman Emperor divert his attention from the Turks long enough to spare you some Imperial regiments? The Spanish Army, led by a succession of viceroys who often found themselves more in conflict with the local Catalan government than with the French, is a motley collection of regular regiments (the tercios), decent cavalry, poorly motivated and equipped militia, and mercenaries. Spain's best assets are her guerrillas, the migueletes, assisted by vigilante bands known as somaten, and the mountainous Catalan terrain. 1) Two map sections representing the northeast corner of Spain at one league (4 Km) per hex. 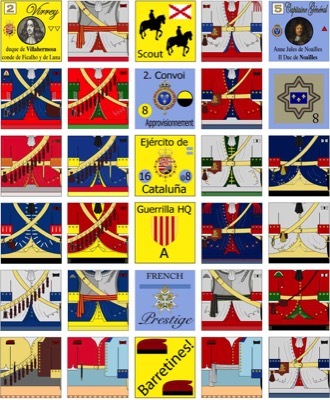 2) 600 die cut counters representing the forces of the French and the Spanish and their allies. Scale is Battalion - that is, the playing pieces represent battalions and regiments.